I recently was given a large collection of Atari items. There were many catalogs in it, including a 6-page DataQue Software "Product Information Release #91.06.03." There is some pretty neat (and hard to believe) information about some two Atari-compatible computers it it. Here is a picture of the first page of the "catalog:"
130XEC: An Atari 130XE computer on a PC card! This will allow you to have all the fun and utility of an 8-bit system hidden in your PC. Using a special MSDOS interface, you're 8-bit applications can use the PC video and other peripherals, in addition to normal 8-bit devices. It may even be possible to run an 8-bit process as a task using Windows 3.0! The 'XEC' will be designed with a high degree of compatibility with the original XL/XE line. Connections will be provided for two joystick ports, cartridge port, audio/video monitor output, SIO connector, and of course normal 80x88 PC card edge. 1600XLE: The Ultimate 8-bit machine... with a blazing 'no wait state" 8MHz 65C816 processor on a 'baby AT' size motherboard, nothing will come close to the performance of this machine. A custom interface chip will allow PC interface cards to be used on the Atari 8-slot backplane. This motherboard will fit into most PC style cases, and will run Atari 8-bit applications which make no illegal entry points into the OS, or use direct screen access. This monster would be for the power users only, not the casual game player! Using normal PC peripherals would keep costs down, and allow maximum expandability. Has anyone ever heard of this company before? A search of the Internet associates someone named Chuck Steinman with some DataQue products. What's the story of these, very-probably, unreleased hardware items? Were prototypes of these computers ever made, or was this just an idea that never even reached prototype stage? What about the other products in this catalog; were they released? 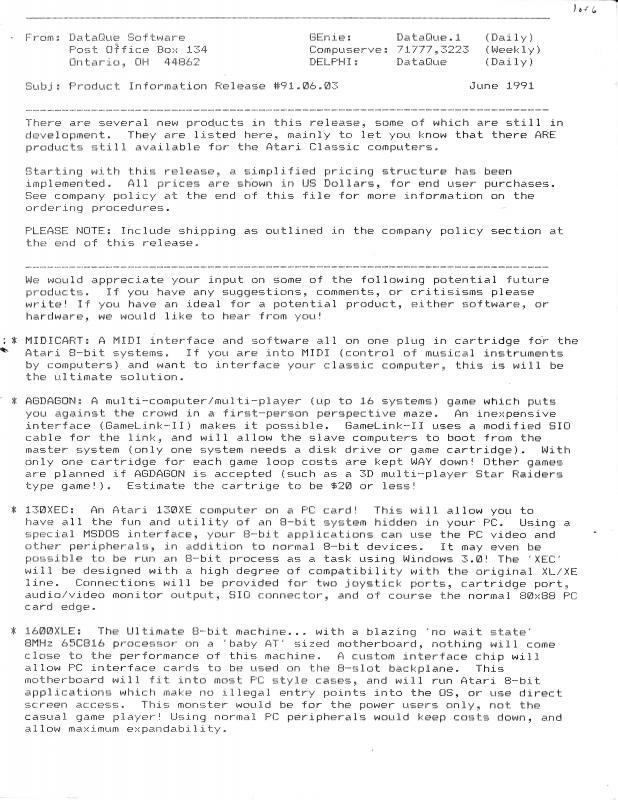 Steinman's claim to fame was releasing the Turbo-816 65816 card for the XL/XE computers. You pulled the 6502 out and plugged in a ribbon cable head that went to the card. There was an edge connector on the cpu card to allow connecting expansion boards. I have 3, 4 ? of the cards, they make up for 256K of linear 65816 memory. The cpu runs at the stock clock speed, there is no acceleration like Rapidus. He also release an OS rom to go with the card, that allows for native 65816 operations. As a private job for me, he designed and built a prototype 80 column board, that he called the MV80. I still have it here, and it works, has a nice, crisp display. I just found his doc for it the other week, explaining the registers, I'll have to see if I can find it again and post it. After a few years after the T816, Steinman seems to have disappeared. I found an arrest record for him from 2009, but I still haven't located him. I don't recall ever hearing about those custom machines from him. Interesting find. Edit: Oh yes, he also released the Maze of Agdagon, a multiplayer game that used the Gamelink? Multilink? system of hooking machines together, like a mini-lan. Never tried it myself, but I think it was pretty popular. Edited by Alfred, Sun Mar 17, 2019 1:59 PM. Never heard about the 130XEC or the 1600XLE, but Agdagon or better Maze of Agdagon was released. There is a demo fileversion 1.0 for one player/one computer and a (fully?) playable fileversion 1.01 and 1.02 for up to 8 (or 16?) players / 8 computers with the gamelink-2 network, better known as multilink here in Europe. Dataque sold the hardware for the older gamelink-1 (via joystick-ports) and the newer gamelink-2 (via SIO-ports) networking programs. Not sure, how Jiri Bernasek (Bewesoft) found out how that gamelink-2 stuff and hardware works, but he wrote several articles about it, wrote several programs for it (Multi-Dash, Multi-Race, Multi-Worms and a network-module that could be used for new programs) and also made some sourcecode available. Today we have 2 or 3 games for gamelink-1 and 6 games for gamelink-2/multilink network. Would not be surprised (with Chuck Steinman's Pokey background - stereo Pokey/Gumby), if they also created and sold the Midi hardware, but as said before, never heard anything about the 130XEC or 1600XLE hardware. Afaik, Dataque was Chuck Steinman and Jeff Potter (Apacview, Degasview, ILBMview, Jview, etc. ), but could be wrong here. Edited by CharlieChaplin, Sun Mar 17, 2019 2:04 PM. That's right, I forgot he did the Stereo Pokey thing. I might even have exchanged some mail, back in the days (when I had no money to buy nice stuff). The MIDI stuff I can't remember, but the 130XEC and the 1600XLE do ring a bell. Thanks for all of the information that everyone posted here. I love running into topics like this one which seem to be under most people's Atari radar. Another fun place to find unusual, often-forgotten, news is to read disk-based "magazines." Hmm, a MIDI Cart. That would be interesting as it frees up SIO. Did it ever materialize? Here is the spec sheet Chuck from DataQue sent me on the MV80 80 column card he made for me. We never produced it because of course it has the same problem all other PBI devices have: there can be only one. You mean due to physical limitations right? I thought the OS provided PBI IDs for devices 0-7? Edited by _The Doctor__, Tue Mar 19, 2019 2:10 PM. Yeah, but nobody did a passthrough, you could have a mio or you could have a Black Box and nothing else. I sure wasn’t going to give up my Black Box, not even for 80 columns. Yes, it’s the physical problem, not the os. While I love my black box, it uses all the pbi... it would need some slight fixing up to be fully compliant, but I did have a thought about making a cable to occupy the XL ribbon connector on the the Black Box with the cable wired and ending in the standard XL card edge pbi or eci/cart connection... I didn't follow thru on it when I realized the BB didn't allow for other PBI id's like the MIO. Edited by _The Doctor__, Tue Mar 19, 2019 4:28 PM. Problem is, neither MIO nor BlackBox use the PBI like Atari intended it to be used. But ICD planned an 80 column board for the MIO and Bob Puff told me, it would be possible to hook extra cards into the system just like the FloppyBoard. (But he had no plans to do so himself) So hooking in an 80 column board would be possible. What also would be possible is to make the BlackBox free up the bus when it wasn't accessed. And Bob thought that if software for the BB didn't use the other ID's (The BB with all the extras uses 5 ID's max), it should be possible to use the remaining IDs for other stuff. Five ? What am I missing: P:, R: D: and ?? As far as I understand, the problem is caused by lack of proper decoding so the BB hogs up all possible IDs. Afaik, Dataque was Chuck Steinman and Jeff Potter (Apacview, Degasview, ILBMview, Jview, etc. ), but could be wrong here. Hmmm, I don’t think Potter was part of DataQue. He and Chuck may have talked a lot, like Puff and I did, but in all the conversations I had with Steinman, Potter’s name never came up, as in ways like “well I get Jeff to test this or that.” Pretty sure Chuck was a one-person operation. Edited by CharlieChaplin, Thu Mar 21, 2019 3:47 PM. this is an amazing find.. love it... the maze game is pretty nice for 1991 especially being multiplayer... thanks for sharing!